Not too long ago, the very last day of June to be exact (2 weeks ago exactly), those of us in the west welcomed the release of BlazBlue: Chronophantasma EXTEND to Xbox One and Playstation 4. 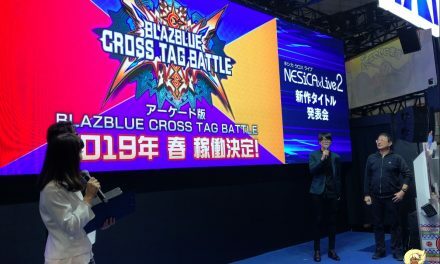 It seems that we are already ushering in a brand new iteration into the fighting game series with BlazBlue: Central Fiction. Even though this seems really early, we must remember that BlazBlue: Chronophantasma originally released in Japanese arcades in 2012 and then on home consoles in Japan in 2013; it is about time for a brand new game. If you are interested in my thoughts on this game’s announcement as well as what we see on the trailer, do not hesitate to go ahead and hit the jump. BlazBlue: Calamity Trigger was the first game within the series and also was the very first one that I started to play. I was really intrigued by the fact that this game felt like a solid fighter while also retaining the feel of a Japanese Role-Playing Game. Since then we have seen two other major entries into the series with BlazBlue: Continuum Shift and BlazBlue: Chronophantasma. Some people are annoyed that we are constantly seeing these games and want them to be a “Complete” game, but I do not mind that we are seeing another entry. You have to realize “BlazBlue: Central Fiction” is technically like “BlazBlue 4“. While yes, like games like “Ultra Street Fighter IV” which does use the same character models and add in a few moves or so, we are gaining tons of new story elements which is the main focus of BlazBlue (at least to me). BlazBlue is unlike a lot of fighting games because of the fact that it has a solid story behind it. Sure, it might be a bit confusing and hard to understand at times, but it is obvious that it is there with its own lore. With each game we have received a brand new story mode (with multiple story paths and gag reels for characters), anime-style cut scenes, and new characters with updated moves and play styles for veteran fighters. I am really looking forward to how the game progresses and how the story winds up (especially my waifu Makoto Nanaya). While I have not yet played BlazBlue: Chronophantasma because the original game was not released on Xbox 360 (I do not own Playstation 3), BlazBlue: Chronophantasma EXTEND is on the Xbox One and I plan to make up for lost time. The person you see above is presumably the woman talking at the very end of the BlazBlue: Central Fiction announcement trailer. I am pretty sure that this is Nine of the Six Heroes, Kokonoe’s Mom, and Jubei’s former lover. I have no idea what she has to do with the story because I do not know her involvement outside of whom she mothered (Kokonoe). Once I get around to finally playing and finding out the story in BlazBlue: Chronophantasma her presence might be of more significance. Something else I noticed was that they added a few new characters that were not presently in any of the BlazBlue games. Those characters happen to be (in order of appearance): Hibiki Kohaku, Naoto Kurogame, and (possibly) Nine. Hibiki Kohaku is wearing a Novus Orbis Librarium uniform, meaning that he is probably in-league or know of Jin Kisaragi, Noel Vermillion, Tsubaki Yayoi, and Makoto Nanaya. Also, he could be part of the BlazBlue: Remix Heart manga (I do not know because I have not read it yet). Naoto Kurogane sounds a lot like Naoto Shirogane from Persona, but it seems that he is a hand-to-hand combatant. They have not shown enough of these characters to get a real feel for how they will fight, but I am really looking forward to Naoto Shirogane from the brief moments of him I saw. Older characters seem to have gained yet another way to fight, something that is popular within BlazBlue games is to give the characters new moves and alter the way their combos hit to change the look of their fighting style. Every character shown seemed to display a new move at some point in their few seconds of screen time. My only problem is that the balancing of the game will be absolutely ridiculous since this game is going to require severe balancing due to the new characters and new character moves… probably a new combat system as well. However, I know the game typically takes an entire year to hit the west, so I know the Japanese players will iron most things out for us. I think the trailer is pretty good and shows a lot of what we can expect from the new game. I am sure the part with Nine talking towards the end of the trailer has something to do with the story-mode aspect of the game, but I am unable to really comment on its importance due to the fact that I cannot understand Japanese and also have not played BlazBlue: Chronophantasma. All-in-all, I am looking forward to good things from the next BlazBlue game!